Horror based on old folklore. This subtrope of Religious Horror is less concerned with organized faiths and divine beings as much as it's concerned with the old folkloric rituals. Thus, while it can still focus on a modern religion, it is more likely to focus on the pagan faiths of yore. Demons, cults and goblins haunt the woods while regular people try to survive. Organized religion is most likely corrupt and/or useless, though sadistic clergymen can be the true danger. If you're lucky, you'll have one heroic Badass Preacher among the whole lot, but it might not do any good against beings much older than any god we know. The phrase was coined by director Piers Haggard in an interview in the early 2000's to describe his film The Blood on Satan's Claw. While the genre was most common in Britain in The '60s and The '70s, folk horror can be from any region or any time. 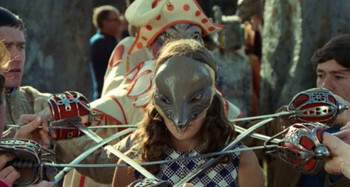 In the 2010's people are talking about the "Folk Horror Revival" to describe more recent films that clearly follows the tradition of the earlier wave of films. Compare with Witch Works, which has a lot of overlap, and Hillbilly Horrors, which have a similar rural horror feel.